MARTENS is one of the leading industrial flooring contractors in Upstate New York. For more than 22 years, commercial building contractors and facilities managers have trusted our expertise, performance, quality and reliability. Today, there’s more to industrial floor coatings than Epoxy. New, advanced Acrylic and Urethane coatings have been developed for specific applications. Hospitals, food handling facilities and laboratories, for example, require an antimicrobial environment. Special floor coatings and additives are available that will help maintain a bacteria free environment. You can count on MARTENS expertise. Over time, surfaces of concrete floors will crack and deteriorate from wear, especially in heavy industrial use facilities, making them unsightly and unsafe. Replacing those worn concrete floors, is not only cost prohibitive, it’s unnecessary. 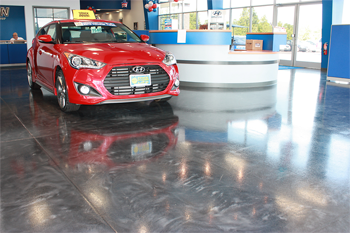 MARTENS can restore the surface of your concrete floors to a beautiful finish that not only will protect the concrete subsurface, but provide a durable and extremely though protective layer that will last for years. ...all for about half the cost of a new concrete floor. MARTENS is a distributor of Simonize 969 and EZ-Clean industrial floor cleaners. They are a highly concentrated, heavy duty, liquid cleaners that contains powerful ingredients to quickly remove grease, oil and grime. They are designed for cleaning the dirtiest floors in machine shops, garages, food plants, etc.. formulated to clean Acrylic, Epoxy and Urethane floors. Available in various sizes, call 241-6000 for more information. The Martens janitorial division has the qualified equipment and personnel to keep your floors in optimum and safe condition by preventing grease and oil build up. You won’t have to stock cleaning solutions and you won’t need extra personnel. Who best to maintain your floor than the people who installed it. Call MARTENS for more information. Existing floor is stripped, cleaned and all holes and cracks are filled with a super tough cementitious polymer. A binder coat of epoxy primer is applied over the prepared surface, followed by an epoxy color coat and a final gloss surface coat . New buildings can benefit from the economy and durability of an Epoxy floor. MARTENS can apply any type of coating with color and application-specific properties such as non-slip, antimicrobial or static dissipation. Works effectively on commercial and industrial floors. To order, call MARTENS at 585-241-6000. 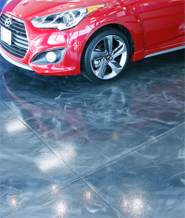 Concrete floors will deteriorate over time, especially under heavy industrial use. Typical damages includes cracks, pitting, and premature settling of floor surfaces, resulting in a potentially dangerous work environment. MARTENS can repair any damage you may encounter with a cementitious resinous composite that is engineered to be stronger than the original concrete floor. You can be assured when MARTENS repairs or levels your floor, the repairs will be as good as new.